I believe that I now have my office at home home carbon-neutral at least day-to-day as of 2008. Now I want to work on the off-site aspects of my business. I remain skeptical about third-party carbon offsetting. Especially planting trees that nominally soak up some agreed amount of carbon/CO2 (for a while). I'm willing to make the capital expediture (capex) to demonstrably reduce CO2 emissions to compensate for those that the business still produces. To this end I am aiming to do more to reduce/offset our home CO2 emissions, and those of friends in other parts of the world with better solar resources (and more carbon-intense electricity, etc) to maximise return per £ capex. These are places where I can be reasonably sure of the energy consumption and where I can trust the equipment to be maintained. In some cases my investment may also help trigger a local government incentive to enable a bigger and better system than might otherwise be possible. As of 2008/03 I'm looking at three schemes: one based on solar thermal here at home in London, and a mixture of solar PV and thermal in Malta and Australia. As a very rough rule of thumb aim that each should offset the CO2 emissions from one of off-site Web servers. As well as these capex-related schemes, I'm also looking at reducing travel. In typical week I visit a client in Canary Wharf twice, travelling from home by (electric) commuter train and London Underground, equivalent to ~3kgCO2 (@100gCO2/mile) or 7kWh of grid electricity per trip in emissions. As of the end of 2008/03 I have arranged with the client that one of those days can be worked from home (ie over a secure Internet connection), and if that proves a robust and practical change then it will halve my regular business-travel related CO2 emissions. And in any case, out of our own pockets we'll be adding another 20cm or so of loft insulation, and we're looking into other insulation to reduce our demand further such as interior and exterior wall lagging on our largest wall. I ordered the (grant-subsidised) loft insulation 2008/04/02 for an expected installion in 2008/06, well in time for autumn and winter, for £200. The essence of this scheme would be to supply DHW entirely for most of the year (and partly in winter), displacing CO2 emissions from gas burning in our boiler, with excess (mainly summer) converted to electricity and exported to the Grid. The primary target for the system is DHW, but the conversion of excess to electricity might be 5%--10% thus comparing well with direct thin-film solar PV (~10%) and may even be more durable (20+ years cf 10+ years for thin-film). Given the north-south line of our roof-ridge, and our location, and our ~10kWh/day gas burn to cover DHW (and cooking) at 70%+ efficiency, then initial analysis suggests 8m^2 or more of collector area (and ~500l of superinsulated hot tank for which we have room) on each of our east and west roof faces (there remains room beside our PV). That might collect ~4kWh/day on average even in deepest mid-winter, or about half our daily DHW energy requirements even in winter, and 100% all the rest of the year. In June the incident in-plane radiation peaks here at ~4.6kWh/m^2/day, which might represent a 25kWh+/day excess that might stress the system and go to waste. The aim is to convert that to electricity at 5%--10% efficiency (this is limited by heat-engine efficiency) and from the excess heat stored in the DHW tank meaning that it could run all night supplying our low base and lighting loads such as clocks, timers, nightlight, etc, avoiding imports and even exporting. This might be a constant 100W to 200W. This would mean that we would have to import little gas or electricity (other than for cooking, and for heating in appliances such as the dishwasher) except in winter, eg for space heating, and even then much less than now. Since I'd prefer not to discard our 70%--80% efficient and newish gas boiler, I can't cover our space heating requirements from solar, and I need a fallback for mid-winter DHW, my plan so far is to modify the existing 'combi' system as little as possible by having a valve arrange for DHW come from the new storage tank (mixed down to 50°C with a mechanical thermostatic mixer valve for safety) until the tank's top temperature drops below (say) 45°C at which point DHW would be drawn from the gas boiler on demand. The gas bolier would drive the central heating as it does now, unaltered. But an alternative is to replace the current gas combi with an top-efficiency (A-rated, 90%+ efficient) model that accepts pre-heated water. That should also reduce our space-heating gas consumption by 10% itself, and make best use of whatever insolation is available in winter. If possible the entire solar DHW system would be set up so that in the case of mains electricity or gas failure we'd still get some hot water from the tank (at the moment if either fails we get none, and no central heating). And I'd have all elements of the SDHW system that need pumping driven by solar PV (small panels separate from our main PV system) so that the SDHW system presents no parasitic electric load. The upshot of all of this if it actually works as intended should be to as much as halve the amount of mains gas we burn year-round, ie as much as 10kWh/day, thus avoiding emissions of ~0.19kg of CO2/kWh, ie up to ~0.69t CO2 per year. I would hope that a 'basic' system, fully commissioned (without seasonal store) and excluding costs for a replacement gas combi, to be around or under £5000. With this project I aim to displace the electricity-related CO2 emissions of the T1000 Niagara Web London server in co-lo (hosted) in Docklands. Assuming that it uses a constant ~2kWh/day at 0.43kgCO2/kWh, ie 0.32t CO2/year, then we have a healthy excess of displaced CO2 over emitted, even if consumption in fact as much as averages double that allowed for or the gas saving is significantly less than expected. Note that the Docklands server also reduces its consumption during the winter electricity demand peak when I assume generation to be most carbon-intense. An irksome element for my wannabe-engineering mind about this scheme is that, in order to have something like adequate DHW available in winter, given the near 10:1 ratio of incident energy on our roof summer:winter, we have vastly more energy in summer than we can use for DHW and at that point we have no need for central heating either. So that 'extra' energy is wasted and simply stresses the collection system. I'd rather pump that energy into the national grid (or into batteries) where it might be useful (eg overnight) and displace fossil-fuel combustion. My current thinking is to use Seebeck-effect (solid-state) generators with the hot end (thermally) at the top of the tank at up to 90°C and the cold end dry cooled to outside air temperature at ~20°C. It might well be sensible to have the generator hot end right at the tank, with heatpipes (134A filled, that can't freeze and require no active pumping) to transfer heat to the outside air, maybe with fan-assisted dissipation there. I aim to generate a constant 100W+ when the DHW tank temperature exceeds (say) 55°C thoughout (after deliberately destratifying the tank contents) we can slowly dump excess through the generators all night if need be meaning we'd be off the grid on solar power even at night most of the time. I'd hope that in the fullness of time this steady solar energy gets rewarded with ROCs or feed-in at premium rates as a little bonus, though we're not going to get rich. It might be reasonable to assume that we could export (or avoid importing) up to an extra 2kWh/day of electricity in summer with this scheme, which might be another 0.1t of CO2 emissions deferred per year. 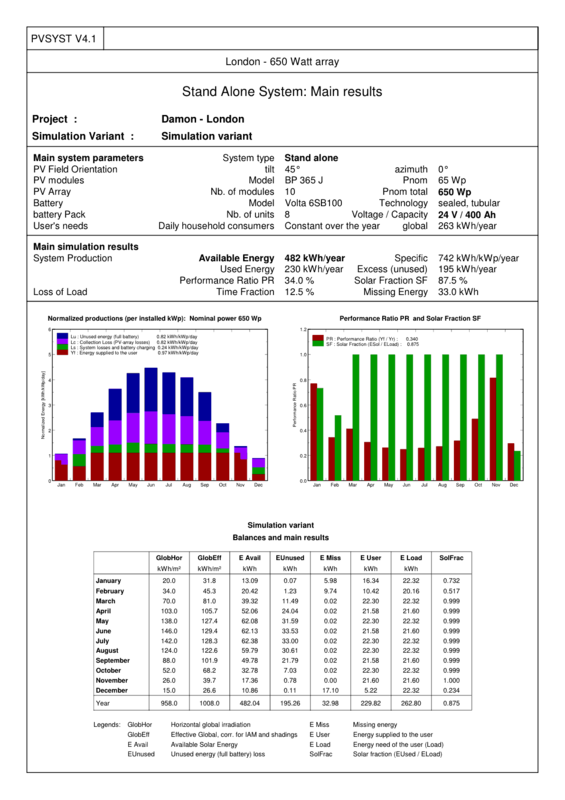 2kWh/day would represent a 10% conversion efficiency at a little over 50% of the maximum theoretical heat engine efficiency by my crude estimate. If turning the waste heat into electricity doesn't work well enough, we can revert to the idea of a seasonal thermal store to absorb excess in summer and play it out again in winter. In this case we only need help cover the solar DHW deficit in winter of possibly 50% corresponding to 4kWh/day for 100 days = 400kWh = ~1.5GJ. If we use the thermal store to 'pre-heat' the DHW tank half way each day (eg half of the ~5°C to 45°C needed, ie through 20K to 15°C) and avoid using a heat pump by never allowing the thermal store to drop below (say) 15°C--20°C, then a simple heat exchanger may do. If we could perfectly insulate the store and raise its entire volume to ~90°C by the end of summer and keep it there until the start of winter, then we could store 70K*4.18kJ/l = ~300kJ/l which implies that our thermal store would need to be at least 5t for this unrealistically-good set-up. If we made the tank larger to allow for heat loss, and placed it somewhere in the house where that heat loss might displace productively some space heating, then possibly a 10t (ie 10m^2) thermal store would suffice to eliminate almost any winter need for gas-boiler backup for our DHW, and would reduce some overheat strain on the solar thermal collectors in summer. A largish tank heat store such as the Solus II 2200l would lose 4.5W/K, ie ~7.7kWh/day (28MJ/day) with 90°C water and 19°C ambient air. Given that we'd want heat retained maybe 180 days from the end of summer until the end of winter, then if we used (say) 4 of these tanks in air we'd lose 19GJ in that time, ie considerably more than we are trying to store! A larger single tank has less surface area and should lose heat more slowly, but we need an improvement of more than an order of magnitude. In fact, the temperature in the store would be ~20°C by the end of winter and thus the rate of heat loss would be much lower by then. And if we buried the store in additional insulation under the house, we might hope to further reduce thermal losses. As it happens our porch storage area could accommodate a 5t+ water tank (ie ~300kWh of raw capacity for ~5kWh/day for 2 months 50% DHW support) although my initial rough calculations suggest a U-value of ~0.01 or better would be needed to leak/lose <10% of the contained heat energy over six months from peak of summer to peak of winter (a loss rate of ~10W) given the water would be up to 80K higher than the external air temperature, and a tank delta-T of ~50K (max temp of the water late summer ~90°C fallen to ~40°C by spring). Note that for example spray foam insulation seems to have a U value of ~0.25W/(m^2.K), ie a thickness of 2.5m or more would be needed! We might be best partially or fully burying the tank in thermal/waterproof concrete under the porch to reduce heat loss and possibly add to the effective thermal mass. A bare TiSun 5000l tank has an ex-VAT UK list price of ~£5600 as of early 2008. David Starkey sells tanks that might be adapted: "The smallest [insulated] milk tank fitted to a milk lorry produced is 9000l, [costing] £2750--£3500" as of 2008/05. 10W loss is impractical needing many metres of foam or vacuum insulating panes. However, instead of a 5t tank losing 10W (10% loss of stored heat over 6 months), why not use a 10t tank losing ~100W (~50% loss of stored heat over 6 months)? The extra energy to put in the tank is readily available in the summer and free, and I need only ~10--20% of the insulation, ie something nearer 50cm than 5m+. The downside is that we'd definitely need to dig down to accommodate a large enough tank as we just don't have lots of ground space. But we might not have to dig much. Additional summer excess might be used to heat up the mass around/under the tank to reduce heat leakage and to act as a further heat store in its own right. I found it hard to find credible sophisticated suppliers of solar thermal, so instead went with more solar PV which has the advantages of familiarity and being able to export any excess to the grid rather than 'waste' them. Consumption of electricity by my office networking, laptop, etc. UK Internet-based services such as the main server in co-lo. UK business travel and related implied direct emissions. The next immediate aim in 2010/2011 is to try to find wind capex projects to cover the emissions from co-lo servers abroad (currently US/India/Australia). As of 2010/09/17 the company purchased a stake in [defunct http://www.unitywind.com] Unity Wind that should have avoided about 5tCO2 per year if the project had gone ahead, which should have been comfortably enough to run three overseas servers at a local grid intensity of up to 1kgCO2e/kWh (eg mainly coal) and a consumption of up to 190W (~4.5kWh/d or 1664kWh/y) each. This capex could have been good for 20+ years once the project was running. But UW's equipment was vandalised and planning permission refused. By comparison, the h2ope Stockport Hydro scheme hopes to avert 87.5tCO2/y for £250,000, ie 0.35kg/£/y, or about 29x more expensive than UnityWind per tCO2/y but still maybe 4x to 5x cheaper than the solar PV on the roof. A small portion of long-term company reserves has gone to this project. The company is working on a super-insulation experiment (with aerogel) as another route to help others offset/avoid emissions. In early 2011 the company put a small amount of long-term reserves into Ecotricity's EcoBonds, and into the Ovesco/Lewes community solar project. Also in early 2011 the company paid for a domestic PV installation in Kingston-upon-Thames. [Archive, 2012] Offsetting calculations for the UnityWind project in Norfolk, UK. [Archive, 2008] Technologies considered include solar thermal for solar domestic hot water ("SHW" or "SDHW" or "solar DHW"), air- and ground- source heat-pumps and thermal stores and dry coolers, as well as the Stirling Engine and the (Organic, ie low-temperatue butane/pentane working fluid) Rankine/Kalina Cycle (ORC) and the Seebeck effect for electricity generation from excess heat. The Fieldlines/OtherPower DIY alternative power generation board. AES Solar Systems for solar DHW. Interesting "tank-in-tank" designs from ACV. [Archive, 2008] Zen (based in the Netherlands/Belgium) makes robust drain-back solar thermal systems. Electratherm makes ORC waste-heat-recovery electricity generators with a claimed efficiency of ~10%, though that might not be at 90°C hot end. If so, solar thermal plus one of these engines could beat amorphous PV in capture efficiency per m^2. Hi-Z Technologies, suppliers of thermoelectric modules, such as the HZ-20 20W module at 4.5% efficiency (~2% for a delta-T of 60K--70K) and about USD190 as of 2008/03. The Insulated Render & Cladding Association for exterior insulation (and improved weatherproofing). The British Urethane Foam Contractors Association (BUFCA), eg for roof interior surface insulation and sealing. "Papercrete" with a reported U-value of up to 0.077 looks interesting. The PELT6230 Peltier device may be suitable for use as a Seebeck generator, available from Greenweld and ScienceStore.co.uk. [Archive, 2008] Thermonamic Electronics offers a number of devices, including the TEP1-12656-0.6 ~15W generator at ~4.2% efficiency, and various clever heat-dissipation 'heatsinks' including heatpipes. Applicable UK planning permission for renewable energy technologies c/o the EST, make signifificantly easier since April 2008 by expansion of permitted "development rights" in England via a General Permitted Development Order (GPDO). The Green Building Store is "committed to products which promote energy efficient, sustainable and healthy buildings." [Archive, 2008] CoolThreads benchmarks for Sun T1000 Niagara servers. The (discontinued as of 2016) [archive] Baxi Ecogen CHP gas combi boiler 92% overall efficiency, 24kW heat output, 1.1kW electricity output. The [archive, 2008] WhisperGen Stirling heat and power system. The Association for Decentralised Energy (was http://www.chpa.co.uk/ Combined Heat and Power Association) for the UK. Interesting Spacetherm aerogel insulation from Proctor. "The aerogel insulation used in the Spacetherm boards has a k-factor of 0.013, this compares to around 0.023 for most types of polyurethane/polyisocyanurate boards, and around 0.030 for extruded polystyrene." Enviromentally seems quite sound too, with an embodied energy of less than most alternatives other than wool. 'Green' server hosting from Host Papa. Sun Microsystems claims teleworking uses half the power of office working (64W vs 130W) before counting transport, with commuting accounting for more than 98 per cent of employee work-related carbon footprints. Travel planning in the UK [archive, 2008] with the ability to compute CO2 emissions. This suggests, for example, that my foot/train/underground commute into London from home is about 3kg of CO2 round-trip, or maybe 300kg for a 4-day week for 6 months. First published 2008-03-30 , updated 2019-04-22 . Site copyright © 2007-2019 Damon Hart-Davis. Hosted by ExNet.